Price Tip: If you hate negotiating and still want the best possible deal, always price shop online first. We recommend Car Clearance Deals, MotorTrend, CarsDirect and Edmunds. These free services will offer you the lowest prices on a new Mercedes-benz and supply you with multiple competing price quotes. You will know the best price before you visit the dealer. Most people mistakenly believe that the Mercedes-benz Invoice Price reflects what the dealer paid for a new vehicle - The true Dealer Cost. It is not! Knowing the dealer cost of a new Mercedes-benz gives you needed leverage when it comes time to negotiate a great price. Negotiating from the cost up and not the MSRP down can save you thousands on your next purchase. MSRP - Manufacturers know how much it costs to build a vehicle. They also have an idea about the price customers should pay for a vehicle. That amount, the Manufacturer's Suggested Retail Price, or MSRP, is a starting point for negotiating a final price. Dealer Invoice Price - Dealers don't work directly for the manufacturers, so they have to buy vehicles from the manufacturer. The price the manufacturer charges is the Dealer's Invoice Price. Dealer Holdback - A portion of the invoice price is returned to the dealer once the vehicle has been sold. Dealers will sometimes agree to sell a vehicle for the invoice price because they know this "Holdback" amount is going to be returned to them. Rebates - When sales are down manufacturers will sometimes help dealers. They will stimulate sales by offering cash rebates and other incentives to bring customers to the dealer's lot. Destination Fee - Getting a vehicle from the factory to the customer is charge dealers add to the bill as the "Destination Fee." Think of it as the postage you'd pay to have something mailed to you. Dealer Incentives - Dealers will offer cash rebates, easy financing, and discounts; sometimes to special customers such as serving military personnel, senior citizens, first time car buyers, and customers who always buy from the dealership. This is also why hot dogs, door prizes and anything else that brings in customers are a part of car merchandising. Regional Advertising Fes - To bring customers in to take advantage of rebates and incentives, dealers have to advertise. All the dealers for a particular brand help pay for advertising in their region. 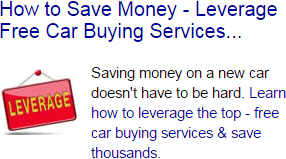 These advertising expenses will show up as a charge to the customer because it is a cost to the dealer. 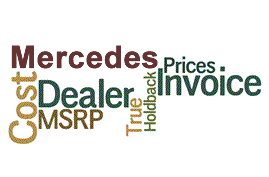 Base Mercedes-Benz Invoice Price + the dealer Invoice price of Options + Destination - Holdback = Total Dealer Cost.